My interest level in Ocean's Eight has never been to the same degree as other people's. I have never seen the original Ocean's trilogy. I hear they are fantastic movies, and I definitely want to check them out at some point, but I have yet to see them. 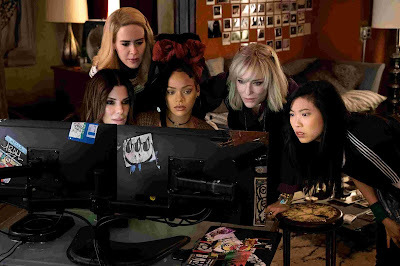 So without that built-in appreciation for the series, Ocean's Eight looked like just another movie to me. And that's not to say it looked bad at all; the trailers really impressed me. But I never really viewed it as the next installment in a beloved franchise like many others did. What stood out to me about this film was the cast. 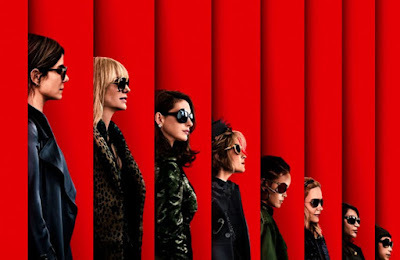 You have some incredible heavy-hitters in the ensemble, including Sandra Bullock, Cate Blanchett, Anne Hathaway, Helena Bonham Carter, Mindy Kaling, Sarah Paulson, and Rihanna. It truly is an impressive cast, and that is what caught my eye the most. I also really like heist films, so I figured I would end up enjoying this movie. 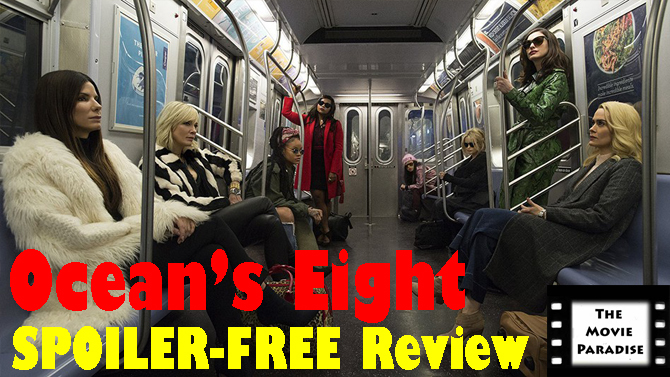 Ocean's Eight delivers exactly on what it promises. It is full of intense thrills and fun comedic comradery, all built around a really engaging heist. Having this group of characters together makes for a really entertaining film, and a good time at the movies. This is a pretty straightforward heist film. Someone has something of value, and they figure out some really elaborate way to obtain it. For a movie like this, I'm not expecting it to do something radically different or entirely unique within the genre. I'm just looking to be entertained, and Ocean's Eight absolutely delivers on that. You have the initial set-up where we are introduced to the characters, and it's easy for this to feel drawn-out and tedious, but I found it to be just as fun as the heist itself. While these characters don't exactly have a ton of depth to them, the performers make them come to life and shine. We know the bare basics about each character, but it's not really about who they are as individuals that matters; it's about what they bring this heist, and that's what makes them work. You have a bunch of A-list talent in this movie, and they all have excellent chemistry with one another, each playing off of the other expertly. It makes the film sharp and fun to watch. While everyone in this movie is great, the one who surprises me the most is Anne Hathaway. I thought she would kind of be wasted, as she is the subject of the heist and not part of the actual crew, but the movie gives her a lot to do. Hathaway plays the role perfectly, and she is really the most dynamic and entertaining character in the film. But across the board the performances are all phenomenal, as you would expect from a cast of this stature. When the heist first began, I was afraid that it wouldn't be compelling enough to last the whole film. However, I was wrong. It's not the most extraordinarily creative heist possible, but it works for this movie. And there are plenty of twists and turns within the film that make it worthwhile. There are a lot of really tense moments that build suspense, and it's that inner anxiety you get while you're watching that makes it fun. It's hard not to get invested. As I've mentioned before, I haven't seen the other Ocean's movies. Maybe compared to the heists in those films, this one seems rather tame and boringly straightforward. But watching it with fresh eyes, I was engaged the entire time. Overall, Ocean's Eight is the kind of movie that is simply good. It doesn't have incredible direction, a brilliant script, or Academy Award-worthy performances. It's just a damn good movie in its own right. As a heist film, it immediately hooks you and throws plenty of twists and turns your way. The ensemble is fantastic, and they all have great chemistry together. My favorite of the bunch is surprisingly Anne Hathaway, who I think really defines the movie. While each element of of the film isn't overly remarkable on its own, when put together it makes for a really fun and engaging movie, and it only makes me want to see an Ocean's Nine more. What do you think? Have you seen Ocean's Eight? If not, are you planning on seeing it? Leave your (spoiler-free) thoughts in the comments section below.